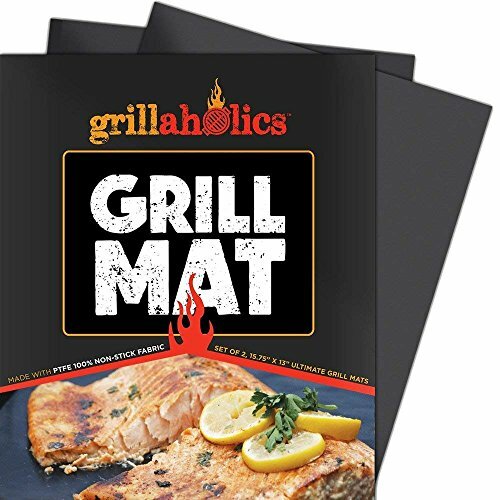 Set of two 15.75" x 13" mats made from heavy duty PTFE (PFOA Free) that makes grilling a dream. Perfect for chicken wings ribs burgers steaks fish shrimp fruits vegetables breakfast and even pizza. Can be placed on top of any grilling space (charcoal gas or electric) and recommended with temperatures up to 500 F.
100% non-stick and dishwasher safe...use it OVER and OVER AGAIN. No more ruined dinners and clean-up is a breeze. PERFECT - Thicker does not mean better. We tested multiple thicknesses before developing our mats. Our grill mat is thin enough to leave grill marks and flavor intact, yet thick enough to provide ultimate heat resistance and durability. With our Lifetime Replacement Guarantee, 2 mats is all you'll ever need. NEVER buy another grill mat again! MULTIPURPOSE - Our cooking mat works with any kind of barbecue grill - Weber, Charbroil, Big Green Egg, smoker, charcoal, propane, gas, or electric. Better than any grill pan or basket, our mat can be cut to any size or shape to fit any need. Also doubles as a bake mat! NO MESS - Never BBQ on a nasty, dirty grill grate AGAIN! Keeps your food from falling between the grates or sticking to the grill! In no time, you'll be grilling like a pro. Reusable and dishwasher safe makes cleanup a breeze! SAFE - These grill toppers are made from premium heat resistant PTFE-Fiberglass coating and contain no PFOA, silicone, or other harmful chemicals. They can withstand temperatures up to 500 degrees Fahrenheit and will not burn. Keep your family safe with a brand you can trust. TOP CHEF APPROVED - The ONLY grill mat recommended by Rachael Ray and Chris Kimball. Best value in bbq grill accessories! Try yours RISK FREE before we sell out! Consider getting TWO - one for you and one for your very best friend! If you have any questions about this product by Grillaholics, contact us by completing and submitting the form below. If you are looking for a specif part number, please include it with your message.